Even if you’re excited to be getting away, flying is frustrating and stressful. We’ve seen too many news stories about overly stressed passengers freaking out and punching each other over something as simple as an armrest or a reclined chair. 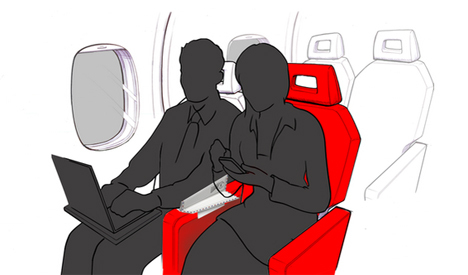 The Soarigami won’t put an end to all in-plane disputes, but it will help cut down on scuffles over shared armrests. 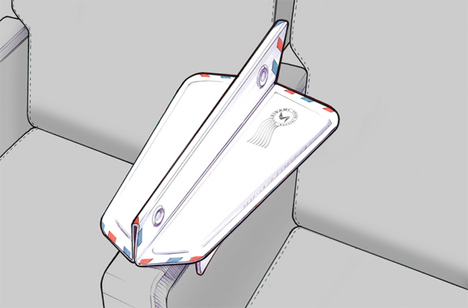 The folding armrest divider is the spitting image of a paper airplane and fits onto the armrest to give you and your next-door seat buddy separate spots to rest your elbows. The designers were inspired to create the Soarigami when a bout of designer’s block struck. Folding up a discarded design into a paper airplane and letting it sail away provided the spark needed to create the clever armrest add-on. The small origami-inspired design takes up hardly any weight or space at all; it’s flat until you need it. Then you just fold it into shape and snap it onto the armrest to separate you from the hairy forearm sitting next to you. Soarigami will be available for pre-order in early 2015.